Sun blocking hats have long been part of the average traveler's kit. Made out of various materials, sun blocking hats serve as your first line of defense against harmful UV rays. Additionally, sun blocking hats give a certain edge to your outfit, depending on their color and style. If you are scouring the market for high-quality sun blocking hats, turn to Shape Flexer. Our sun blocking hats are created using only industry-leading materials and the exceptional techniques of our team. No matter your outdoor adventure, you can expect our sun blocking hats to offer optimal portability and proper functionality. Few people realize the significance of wearing sun blocking hats when performing outdoor activities. The benefits of sun blocking hats go beyond enhancing your style and look. Our sun hats lessen the damage caused by UV rays to your skin. When you use one of our sun blocking hats, you'll be doing your skin a great favor. 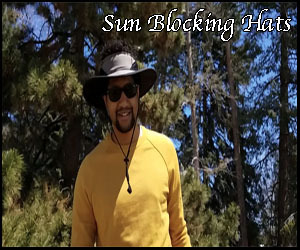 Our sun blocking hats can act as a barrier against the sun and heat. Wearing one of our sun blocking hats helps protect your skin from sunburn, sunstroke, and heat exhaustion. Our sun hats help minimize your risk of skin cancer. Too much sun exposure can pose great dangers to your health. Luckily, our sun blocking hats help decrease your risk of health complications such as skin cancer and melanoma. For maximum protection, you may also wear one of our sun blocking hats with a sunscreen or other sun protective products. Find out more about sun protection with hats here: https://www.skincancer.org/prevention/sun-protection/clothing/hats-the-stylish-route-to-sun-protection. Our sun blocking hats help protect your eyes. Eye damage is linked to excessive exposure to sunlight. That's why, as kids, we were advised not to stare at the sun. Using one of our sun blocking hats, you can help protect your eyes from the sun's UV rays. This protective headgear would especially be helpful to people whose work or idea of recreation involves extended exposure to the sun. What Sets the Shape Flexer Hat Apart From the Competition? Our sun blocking hats are designed to adapt to various lifestyles and activities. Whether you're mowing your lawn or hitting the beach, our sun blocking hats can give you the protection you need against the sun. These sun blocking hats can also add a stylish edge to your outfit, which may be worth bragging about on social media platforms. You may find sun blocking hats with a thin, flimsy wire or those without one at all. These sun blocking hats usually offer poor flexibility, which can be an inconvenience when you have to keep your hat in a pack. Our sun blocking hats are different. The Shape Flexer sun blocking hats have a patented, durable wire built into their brim, which you can bend and fold to your liking. Because of this Shape Flexer feature, you can fit our sun blocking hats into the smallest of bags with ease. Because everyone has unique hat needs, the Shape Flexer sun hat is created with an adjustable cord. Using this cord, you can loosen or tighten one of our sun blocking hats until it fits comfortably on and around your head. Our sun blocking hats feature a deployable, hidden neck cape. Wearers of the Shape Flexer hat can use the cape to protect and prevent their nape from prolonged exposure to the sun. Do you need an all-weather and all-purpose hat for your work or recreation? Purchase our bendable, machine washable, portable, and wind-resistant sun hat today! The Shape Flexer sun hats are available in four exciting colors: Original Adventure Mix, Sahara Khaki, Dark Charcoal Grey, and Fuchsia Purple. Get in touch with us to learn about the history of Shape Flexer.